It is immediately apparent in Alain Platel’s and Fabrizio Cassol’s Requiem pour L. that ‘L’ refers to Elle whom we see on a cinematic screen at the back of the stage. Filmed in close-up by Natan Rosseel she is dying peacefully at home, lying on a cushion surrounded by the partially cropped hands and faces of loved ones, her face tired, her eyes opening and closing slowly, her mouth going through the motions of swallowing, her expression one of neither content nor distress. The film is shot in black and white and slowed down considerably, so that heads pass in front of the lens with impossible slowness temporarily obscuring the woman’s face. Hands stroke her fair, softly frizzled hair and mouths whisper in her ear; a man’s face appears, possibly the woman’s son, for her smile and her gaze rest on him with a devotional intensity. Her entire being engages with him in some final, inaudible words before she closes her eyes again and lapses into a peaceful repose. Slowly, almost imperceptibly, her mouth falls open as death creeps up and life leaves her. The images convey not only the reality of this woman’s final moments but the fragility of life as it simply and effortlessly drains away. The video, edited by Simon Van Rompay, lasts for the duration of Requiem pour L. and is in itself a silent, reflective requiem in moving images. Cassol’s reinterpretation of Wolfang Amadeus Mozart’s Requiem, based on the traditional funeral mass, serves as both an accompaniment to Elle’s final journey and as a requiem for her death. Cassol had researched Mozart’s score in original manuscripts, both transcribing and reworking it for a band of predominantly African musicians and vocalists with whom he and Platel had already worked. His score reimagines the Requiem through two contrasting cultural traditions, European and African — or, as dramaturg Hildegard De Vuyst writes, as ‘a different kind of ceremony for mourning that is neither Western nor African’ — while Platel’s direction reinforces this duality by bringing them together. The performance references a traditional ritual of leaving a stone on the tomb of a loved one as a personal memorial, a quiet act by each of the musicians that reflects the poignancy of the screened images. As João Barradas begins the Introitus on his accordion, the notes lend an eerie dimension to the ghost-like figures attending the dying woman on the screen. A change of rhythm interrupts the reverie as the other members of the band and vocalists enter; Cassol’s concept weaves non-Western cultural references to mourning in an array of vocal gestures and instrumental sounds (conducted by bass player Rodriguez Vangama) that generate contrasting registers and harmonies. 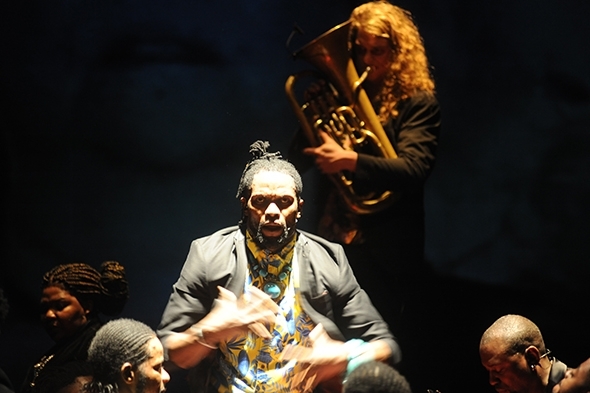 In place of Mozart’s four soloists there are now three, a tenor (Owen Metsileng), soprano (Nobulumko Mngxekeza), and countertenor (Rodrigo Ferreira) who combine with three black voices from the oral tradition (Fredy Massamba, Boule Mpanya and Russell Tshiebua) to bring to the structure of the Catholic mass socially shared rituals and expressions of pain as well as celebration that prove compelling. On stage, however, Van Rompay’s slow motion, ethereal, images are seen in stark contrast to the monolithic maze of black podiums on which the movement of the musicians and performers is grounded, while overhead lighting places shadows on the lower parts of faces so that often a voice is heard but the mouth from which it issues cannot be seen. It is left to the non-place of Cassol’s reimagined Requiem to seek to bridge the divide — both aurally and spiritually — between the visual and performative planes of the work, though it is not entirely successful. Cultures relate to death and ritualize mourning differently; in Western industrialized societies such practices have been increasingly sanitized and privatized. Death happens quietly behind closed doors and how we die is seldom discussed openly and even less seen publicly. At the risk of provocation, Platel and Cassol overturn this tradition and interrogate a western religious musical form with an alternative mourning tradition. Each in itself is a separate project that questions the order through which we understand a cultural offering, and in this respect Cassol’s score in itself sets up a meaningful perspective. However, the juxtaposition of his choreographed Requiem and the intensely private video is not enough to suggest a new cross-cultural framework for commemorating the dead. For that an entirely new grid — to borrow a term from Michel Foucault — would be needed to merge the two in a unified whole. This has not happened, leaving the two projects stranded in close proximity.